THE ORIGINS OF BLACK MUSIC REVEALED IN NEW BOOK, "BLACK AMERICAN HISTORY, FROM PLANTATIONS TO RAP CULTURE"
Nationwide -- The new book Black American History, from Plantations to Rap Culture is a must-read for readers who may have an avid interest in the origins of Black music in various genres, especially rap music. 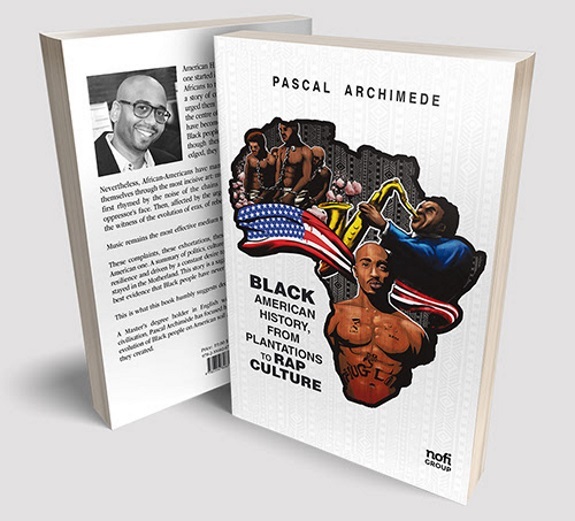 "At every stage of their integration on American soil, Black people have created the kind of music that reflected their social and economic integration as well as their state of mind," writes internationally acclaimed author Pascal Archimede, about his latest book. Black American History, from Plantations to Rap Culture, or black America explored through its institutions and artistic productions. Widely accessible, this story of millions of American citizens is told from their first steps in the New World to today through a cultural prism both original and essential. From the transatlantic slave trade to the ecclesiastical pillar, through abolition, school and politics, this work suggests reading the African- American music as a succession of existential movements. The author analyzes the codes of this extraordinary art, which has always been the highest form of testimonials of Men's earthly passage. What challenges did black Americans have to face when they created blues, jazz, rap? Pascal Archimede embarks us on a timeless journey between past, present and future; between identity and captivity; between disappointment and progress towards the liberation of a Nation. "For this book, on the academic side, I focused my research on the link between the evolution of black people on American soil and the various types of music that they created," says Archimede during a recent interview. "On a personal side, I am from Guadeloupe, a French speaking island in the Caribbean and I'm aware that our fate is linked to the Afro-Americans' one. Our common ancestors who were brothers, sisters, cousins, parents, relatives, were massively deported from Africa on the same boats and were dispatched on various lands. So we all got isolated geographically, culturally, spiritually and linguistically. Those are the reasons why I got interested in writing down this book." Pascal Archimede is a translator/interpreter as well as a successful ESL trainer who holds a Masters degree in English with a specialization in American civilization, and a Professional Masters in Skills Development in Adult Training. His passion for music led him to create a unique language teaching method based on music. As a result, Pascal released his first book Music in Professional Language Training. The success of this book and its subsequent teaching methods provided the author with invitations to leading colleges, universities and international conferences throughout Europe. Committed to promoting culture, he is also working with the Black-owned French speaking media company NOFI for which he's interviewed A-list names such as Jada Pinkett Smith, John Boyega and the cast of the mega-hit film Black Panther when it premiered in London. Today, Mr. Archimede makes his home in Hollywood, FL with his wife and two children. But he's been a citizen of the world. He lived in Paris almost 16 years and before that, London and prior to then he resided in Barbados. Pursuing his quest for knowledge and information, he has published Black American History, from Plantations to Rap Culture in French and in English, both available at Amazon.